Before you guys get all angry with me and want to burn me at the stakes, let me say this: all opinions expressed within this post are my own. They are not meant to deride, disrespect, or suggest that beliefs contrary to mine are unworthy or inaccurate. I'm not attempting to bombard you with regulations, or create new natural hair "rules". I'm far from what most would consider a "Natural Nazi". I'm just sharing what I think, what I feel, and what could possibly be keeping some of us from achieving the healthiest hair possible. Being "hair-ready" for the 'gram is one thing, but what happens wit that hair after all the photos are filtered and posted is another. I could go on a week-long diatribe about the intersection of vanity, self-worth, and how social media drives our narcissism and need for attention, but that's not what this post is about -- kinda. If you guys notice, I've been doing a little less social posting and blogging recently. The reason is twofold. One, I'm a little busy with a few other things (which I'll share in a later post). Two, every once in a while I like to sit back and observe -- trends, what's popular, what's not, and what is and isn't working. I even did a little experiment with you guys -- and I'll reveal what that was later. In the process of being more observant, I've began to notice some trends with natural hair that I'm really not a fan of. I don't mean to be all preachy and judgy (see disclaimer above), but there are some things that used to be "few and far between" that are becoming increasingly commonplace. I'm always Team #DoYouBoo, but I just want us to understand that a lot of this "doing" comes at a price -- the health of our hair. I know, this may seem weird to some of you. Picking and teasing is par for the course for many popular vloggers and Instagrammers. It's how they achieve that big, otherworldly fullness that gets reposted and oogled over. Make no mistake -- I think the results are consistently gorgeous. But the truth is, in order to maintain that fullness, the hair has to be consistently manipulated -- leading to breakage, increased tangles, and a wash day that nightmares are made of. Most of our hair grows up and out, so relatively speaking, fullness isn't difficult to achieve (unless you have low density hair). If you want to experience big hair without the damaging side effects, try getting a cut or trim to add shape back into your hair, or experiment with lighter hold products like curl creams and leave-in conditioners. Breaking a gel cast is fine, as is a little fluffing and shaking (I do both). But I'm not really feeling the idea of picking and teasing hair to fool folks into thinking I've got more hair than I actually do, and risking having less hair in the end because of it. I know ladies, stretched hair is ev-er-ry-thang. It helps you achieve more elongated styles, and allows you to show off a little extra fullness with a side of length. For some of you, it may even ease the drama and tangling associated with highly textured hair. But too much of a good thing can be bad for your healthy hair journey. Blow drying with heat causes a "flash drying" effect, which literally zaps the moisture from the surface of the hair as well as the water deep within the cortex. As a result, the cuticles of the hair become dry, stiff, and brittle. When the hair is flexed or moved, the pressure of the movement causes the cuticles to crack In this weakened state, making the hair more susceptible to breakage during manipulation such as styling and combing. You can help counter that with some of these tips, but I would also encourage you to find other ways to achieve similar results. Loosely twisting or braiding the hair and sitting under a hooded dryer (indirect heat) or air drying before styling works, as does loosely stretching and clipping around your head (a la silk wrap). And of course, if you're going to use direct or indirect heat anyway, at least use a good heat protectant. Well ladies, that's all I got. Remember, I'm always a fan of doing you -- but if the healthiest hair possible is your goal, you may want to re-think these practices in your regimen. 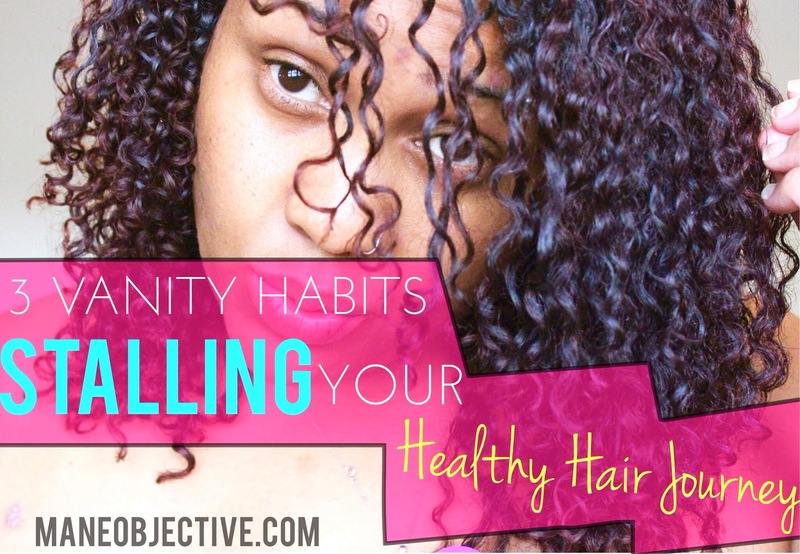 What vanity habits did you have to fall back on in pursuit of healthy hair?